The Despicable Me series dumps its leading man (Steve Carrell’s villainous Gru) to give the people what they want (the people here being children under the age of 11) with this summer’s Minions. Taking top billing for the first time, pill-shaped sidekicks Kevin, Stuart, and Bob get the prequel treatment in a film that follows them on their search for a despicable master to serve. Along the way, they get tangled up with Scarlet Overkill (Sandra Bullock), the “world’s first female supervillain,” as well as a slew of other characters voiced by the likes of Jon Hamm, Michael Keaton, and Allison Janney. 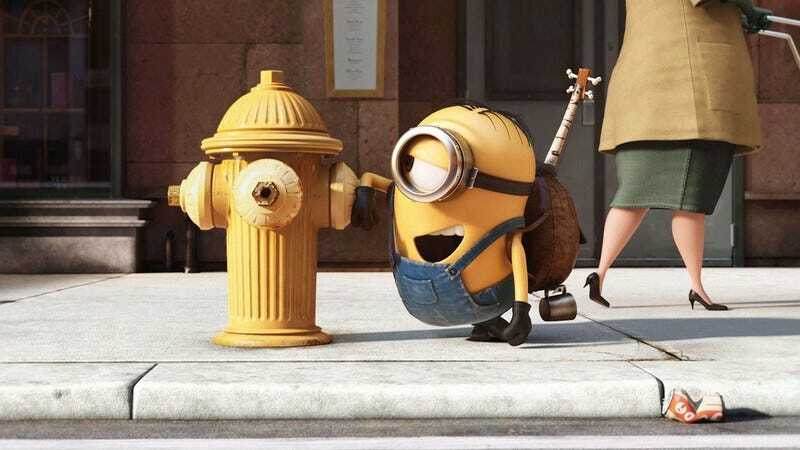 Minions comes to theaters everywhere on July 10, but The A.V. Club and Universal pictures have an opportunity for you to see if for free on July 7. For your chance to win a pair of passes to the advance screening, simply follow the link here and enter your information. Remember: Seats are first come, first served, so be sure to arrive early. An official plot synopsis and trailer can be found below. “The story of Universal Pictures and Illumination Entertainment’s Minions begins at the dawn of time. Starting as single-celled yellow organisms, Minions evolve through the ages, perpetually serving the most despicable of masters. Continuously unsuccessful at keeping these masters—from T. rex to Napoleon—the Minions find themselves without someone to serve and fall into a deep depression. But one Minion named Kevin has a plan, and he—alongside teenage rebel Stuart and lovable little Bob—ventures out into the world to find a new evil boss for his brethren to follow. The trio embarks upon a thrilling journey that ultimately leads them to their next potential master, Scarlet Overkill (Sandra Bullock), the world’s first-ever female super-villain. They travel from frigid Antarctica to 1960s New York City, ending in mod London, where they must face their biggest challenge to date: saving all of Minionkind…from annihilation.